Mothers Day Cupcakes show that you care. Follow these recipe suggestions for great gift ideas. Can there be a better way of showing mom how much we love her than by baking her a batch of her very own cupcakes? I love vanilla cupcakes because they can be teamed with any frosting and look gorgeous. Mom will love a plate of pastel frosted cupcakes. 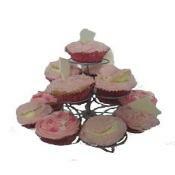 Fondant in delicate hues (pink and green look stunning together) with cut out shapes will really impress everyone. Or, why not pipe pastel coloured buttercream frosting on to the cupcakes? 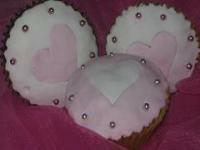 You can add an edible cupcake decoration to really "dress up" your Mother's Day cup cakes. If your mom likes citrus flavors she will really enjoy my orange blossom cupcakes. The white chocolate frosting makes them simply delectable. Apple blossom cupcakes are another popular choice. These easy to make cupcakes can be lightly dusted with icing sugar to make a delicious treat. If Mom enjoys chocolate, try my chocolate hazelnut cupcakes. These cupcakes are really yummy. Heart-shaped Bleeding heart cupcakes are also great to make for Mom's special day. The red strawberry jam will spill onto the plate when you spoon into this just-baked cupcake. Delicious. Make a dozen cupcakes and put them in a gift box and give them to Mom on Mothers Day. Line the base of the box with soft fabric (such as tulle) that matches your cupcakes and then wrap in cellophane. Mom will love whatever you decide to make her. For more Mothers Day cupcake ideas visit my recipe page.